Conversely, when you ask the question, “who’s this product for?” and get an answer like, “it’s for single executive women who live in Tribecca, have aspirations to be a managing director and spend their summer weekends in the Hamptons,” then this is as green as lights get. These clients not only know who their target market is but they’ve likely designed the product with this demographic in mind. Does this mean there are no products with “everyone” as the target audience. A clogged colon is certainly an urgent health problem. Wouldn’t such a product be for everyone? To be in the target audience for this product, the prospect has to not only 1) have a colon but 2) be conscious of this fact and 3) care about it. And in our direct response world, this consciousness of the condition is usually rooted in a health problem, which we as copywriters must agitate if we want them to respond. Take a look at the mess of an ad on top — the one with all the headlines. Here’s a re-cap. Take a deep breath. 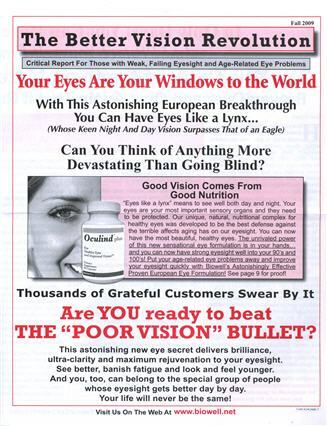 It has a newsletter type header, “The Better Vision Revolution,” then a headline in red, “Your Eyes Are Your Windows to the World,” then a sub-headline with”Astonishing European Breakthrough,” then another sub-headline in the form of a question,” Can You Think of Anything More Devastating Than Going Blind?,” then a text box with an image of a woman’s face and the product…then a pre-head, “Thousands of grateful customers swear by it” and again…another bold red headline, “Are YOU ready to beat the “POOR” VISION BULLET?”…whatever that means. I’ve seen some ad writers go astray but rarely as flagrantly as this. Is there any reasoning behind it? Yes, it bears resemblance to the marketer who claims his product is for everyone. 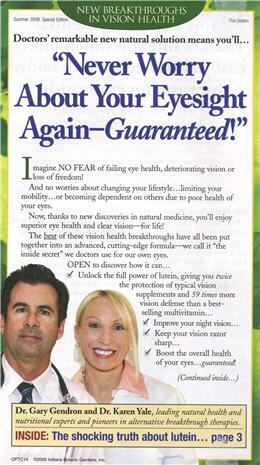 Instead of picking one hard-hitting headline and focusing all energy on it, like the exemplary “Never Worry About Your Eyesight Again — Guaranteed” or Gene Schwartz’s “Your Eyes Can Heal Themselves,” this ad writer reasoned that the more headlines he crammed onto the page, the higher the response. But copywriting doesn’t work this way. It didn’t work when Claude Hopkins penned his immortal headlines over one hundred years ago, nor when Gene Schwartz wrote his giant promise headlines forty years ago, nor does it today. This kind of copy approach is like grabbing a shotgun and firing pellets in every direction without striking a single target. It’s no surprise that the Botanic Choice magalog mails over and over and the Gene Schwartz space ad had years worth of insertions. They know their target market and strike at the white hot core of it — the fear. Have you ever seen the look of fear on someone’s face who’s losing his eyesight? It’s palpable. “Never worry…again” addresses this fear, arguably the most important driver, right in the headline. 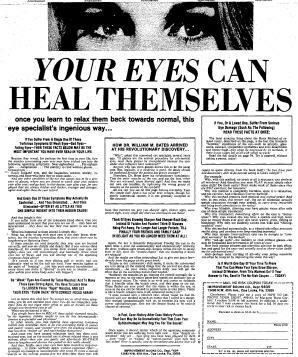 Ditto for Gene Schwartz’s ad which centers on a non-intervention approach to healing eye troubles. Gene would not write the headline until he vaccuumed all the claims out of a book, prioritized them, then let them percolate for a while. But it doesn’t really matter which headline school you belong to — crafting the headline as your first copywriting step or waiting to the end. What matters is knowing your target market so well, you know what your average prospect eats for lunch, which magazines he reads and what his secret aspirations are. Once you know this, the headline is often more than halfway written. Great article. You hit the nail on the head. I really appreciate all you do here on your blog. TONS of value! I always read your blog and get some inspiring ideas every time. Thumbs up!! Absolutely correct. When I encounter a “this product is for everyone” situation, the first thing I do is break down “everyone” into specific demographics and start writing headlines for each of them. Really good, insightful stuff, Lawrence. Thanks! P.S. Making the ads enlargable would be great. Very true Lawrence. However,the copy writing gurus who sell their courses should actually drum this home to newbie copywriters at the outset. Because from my experience, once you understand the target audience, you can then work on creating an offer which is more relevant. And then the copy usually writes itself. That is my experience – for what it is worth. Great post, very detailed and lots of essential lessons to learned. Thanks! Very informational post. I got more out of this then I get out of a lot of other “newsletters” or articles that I am signed up to receive on a monthly/weekly basis. Thank you for sharing all this knowledge, I have become an instant fan, first time on the site and feel like I’ve struck gold. I find what you write to be both engaging and useful and your examples are great. This was particularly so on both dimensions so I thought I’d tell you so. Keep on trucking, my friend. Thanks Srikumar. Only my momma calls me “Larry” but I may make a rare exception in your case. More of the best. How do you continue to do it? Look forward to seeing you next time in Phoenix/Scottsdale! Great post! Knowing the target audience is half the battle not just when it comes to writing headlines but for the whole campaign. Writing for a targeted audience is far easier than taking the shotgun approach. Well, the copy writing experts which promote their particular classes ought to really drum this particular home to newbie copy writers at the start. I think, once you understand the mark market, then you’re able to focus on making a proposal that is a lot more related. And therefore the duplicate usually creates itself. That is my encounter — for the purpose it really is really worth. Need to know your target market, and what drives them. The sad truth is marketers/entrepreneurs look at the first example and think that is the right way to do it, because apparently that’s what the successful ads do. As a publishing consultant, I run into the same problem constantly. Q: “Who’s the target audience for your book?” A: EVERYONE needs to read my book. That answer tells the entire story: the writer hasn’t figured out his market, thought about how to reach it, or designed the book to fit the niche, if there is one. Sigh.